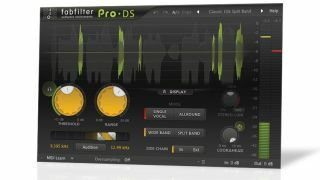 The Pro-DS de-esser is the latest in FabFilter's Pro range of 'workhorse' plug-ins. Frederik Slijkerman is co-founder of FabFilter, the developer behind innovative plugin synths and effects including Twin, Saturn, Volcano and the excellent Pro range. When and how did FabFilter get started? What was your original goal? "We [Frederik and co-founder Floris Klinkert] started out in 2002 with the goal of creating great-sounding synthesisers and effects, releasing FabFilter One as our first plugin in 2004. This is still our main goal, but as our plugins have become more complex, we're also focusing more and more on next-level user interfaces with good design and workflow. "As far as the name is concerned: we liked the sound of it and we were proud of the filter algorithm we developed for FabFilter One. Having two F's in the name was a bonus as both our names start with an F."
FabFilter is known for innovative graphical interfaces. What would you say makes a great interface? "Traditionally, plugin interfaces have been a recreation of analogue hardware. From the beginning, we've been trying to break out of that way of thinking and create new ways of interacting with software. Our goal is to improve your workflow, making it a pleasure to work with our products." At first, FabFilter was focused on 'creative' plugins (synths, delays, filters, etc) but in recent years, you have focused on your Pro range. Why the change in emphasis? "After the release of FabFilter Pro-C, our compressor, it became clear to us that there was a lot of potential for good-sounding and easy-to-use 'workhorse' plugins that you can use on about any track in a project. "It's not that we only focus on this - we just released Saturn a year ago - but we'd like to offer a FabFilter plugin for all major production/recording tasks. In the future, we're aiming to further expand our Pro range while also keeping our creative line up-to-date. Both are very important to us." Tell us a little about your development process. How many new plugins are you working on at any one time, for instance? "We are often toying with multiple ideas, trying them out to see what works and what doesn't. Sometimes Floris and I are working on different plugins at the same time, but as one of them nears the beta phase, we usually join forces and work together to finish it. There are a couple of projects that were ultimately never completed, but I can't really go into this any further..."
What's next from FabFilter? Have you thought about branching out into other areas, such as making iOS/Android apps, producing soundware, etc, or are you firmly focused on plugins? "We have a lot of ideas for new plugins and updates to our existing products, so there is more than enough to do for the next couple of years. "We don't currently have plans for dedicated iOS apps, but we are of course already offering our plugins as in-app purchases for Auria on the iPad. We might do other types of software as well in the future, but we're also wary of diverting our attention too much. Focus is a good thing."